While it was supposed to ship next month, Microsoft now says the mega-display and conferencing tool will be held back until January. 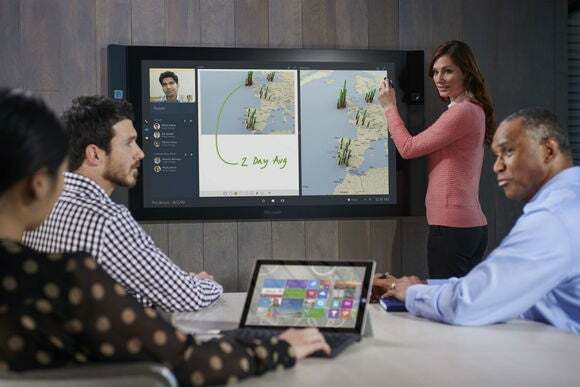 People who pre-ordered the Surface Hub from Microsoft were notified Wednesday that their mega-display and conference room collaboration tool won’t arrive until 2016, at least four months after Microsoft originally planned. Pre-orders for the Surface Hub, which is a massive touch-sensitive and camera-equipped display designed to help people work together in an office and across the Web, opened July 1. Following strong demand for the devices, Microsoft said two weeks later that it would be reworking its manufacturing processes to keep up with interest, and would have to delay the devices’ roll-out. Wednesday’s announcement means companies that planned to install the devices know when to expect their new hardware. “Surface Hub devices will begin shipping on January 1, 2016,” the company said in a blog post. The device can run a variety of applications tailored for workplace collaboration like PowerPoint and a version of Skype for Business. It’s designed to reinvent the process of holding meetings by bringing in digital content that can then be shared with users both during and after a workplace get-together. Microsoft has been pushing hard to improve workplace collaboration with its new software projects, including Office 2016, which allows users to work together on documents in real time through new desktop apps. Microsoft first announced the Surface Hub at its Windows 10 event in January, showing off the device’s 84-inch model, which sports a 4K resolution display and can be purchased for $20,000. There’s also a smaller, 55-inch model that sports a HD screen and costs a comparatively affordable $7,000. In order to purchase the devices, companies must go through the network of partners and resellers that Microsoft has set up. The Surface Hub is a key part of Microsoft’s roll-out of Windows 10. In addition to powering expected hardware like PCs, tablets and phones, the company is pushing what it considers to be new computing experiences like the Hub and the HoloLens, its augmented reality headgear. The good news is that businesses are interested in trying out the new technology at a rate Microsoft didn’t expect. Unfortunately, it also means people will have to wait to try it.